Happy Birthday can be expressed with the gift of flowers from SISTERS FLOWERS & GIFTS in Kirkwood, MO. Whether you're looking for a unique birthday gift or party decor, floral arrangements are always sure to make a statement. Out of town? Don't let that stop you from wishing someone "Happy Birthday". 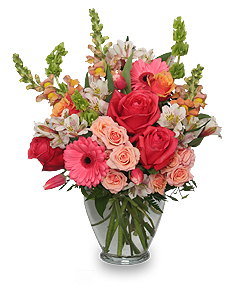 Surprise them with a vase of our best roses, tulips, or daisies, just to name a few, from SISTERS FLOWERS & GIFTS. There really is no better way to say, "I love you" or "Just thinking about you". Browse our selection of sample birthday arrangements. Order online or give us a call today. Letting someone know you're thinking about them when they're sick or feeling down can make such a difference. Send your friend or loved one the gift of flowers to lift their spirits. Get Well Soon gift baskets are another great choice. We can fill them with juice and snacks, which is perfect for someone needing their bed rest. SISTERS FLOWERS & GIFTS can deliver to all local hospitals as well as homes in Kirkwood and even across the country! Give us a call, stop by, or shop online! We have everything you need for Get Well wishes.